As always, the festival will be hosted by the Shenandoah Valley’s very own The Steel Wheels and presented by WNRN and South Street Brewery. The festival will feature 35 bands performing on four different stages, each bringing their own approach to traditional American musical forms. 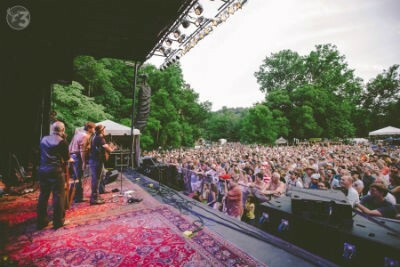 Headlining acts include Robert Earl Keen, Punch Brothers, Sara Watkins – Sarah Jarosz – Aoife O’Donovan: 2015 I’m With Her Tour, The Wood Brothers, Spirit Family Reunion, The Steel Wheels, The Travelin’ McCourys and Nikki Lane. In addition to musical performances, the family-­‐friendly festival will offer community dances, kids activities, food and craft vendors and easy access to the Shenandoah Valley’s phenomenal outdoor recreation opportunities, including organized bike rides led by the Shenandoah Bicycle Coalition. The Red Wing Roots Music Festival is an environmentally aware event, and organizers encourage attendees to use their own reusable beverage containers. Souvenir steel cups can also be purchased on-­‐site. Drinking water will be available for free, while craft beer and wine will be sold in the South Street Beer Garden. The Steel Wheels founded the Red Wing Roots Music Festival in 2013 to bring home to the Shenandoah Valley the exciting atmosphere they experienced while performing at festivals all over the country. Natural Chimneys Park is a beautiful location in the heart of the Shenandoah Valley, near Harrisonburg, Staunton and Charlottesville. In the festival’s first two years, attendees have been treated to the wealth of national talent performing at Red Wing as well as numerous local bands from the Valley’s rich musical scene. Last year’s second Red Wing Roots Music Festival built on the success of the first event, drawing approximately 2,750 visitors who loved the music, the beauty of the setting, and the intimate, friendly atmosphere. Determined to keep that atmosphere, organizers are limiting ticket sales to 3,000 this year. With sales running far ahead of this time last year, fans are encouraged to buy tickets soon while supplies last. Although Premium RV camping at Natural Chimneys Park sold out quickly, on-­‐site tent camping passes are still available.